Knowledge of the turbulent heat fluxes at the air-sea interface is required for characterizing air-sea interactions that will improve modeling weather and climate processes. Obtaining accurate measurements on global scales, however, has been extremely challenging. Direct measurements are very limited in both temporal and spatial coverage and modeled fluxes are subject to various uncertainties. These factors have spurred the development of space-borne methods to retrieve the flux components. Multiple satellite-based flux products have been developed, but these, too, face several different problems. The majority of products are based on application of the bulk aerodynamic flux formulas using inputs derived from satellite measurements. The primary inputs include the surface wind speed, sea surface temperature, air temperature, and specific humidity. Of these, estimation of the near-surface specific humidity and air temperature is most challenging and has been subject to the largest uncertainties. Ensuring accurate and consistent calibration across multiple satellite platforms is also problematic. 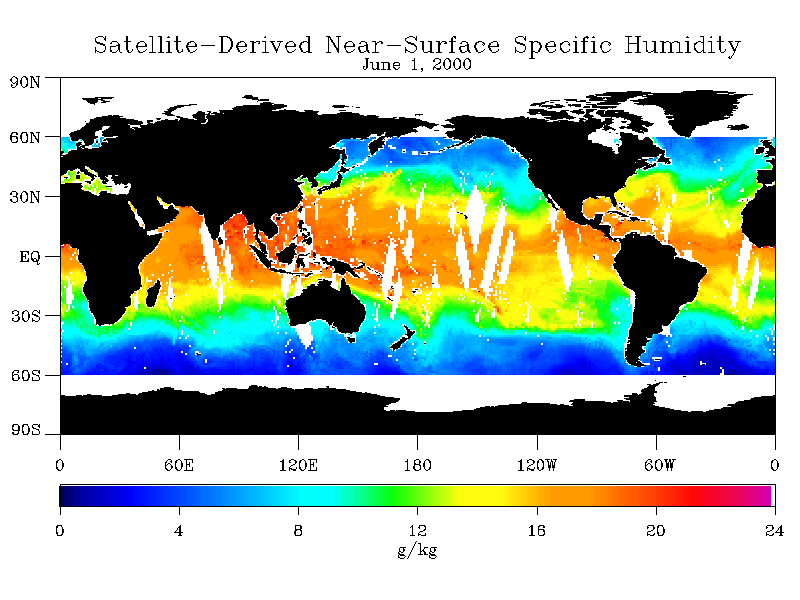 Current satellite sensors are unable to directly retrieve the air temperature and specific humidity just above the ocean surface. Sounders retrieve information corresponding to broad layers while radiometers like SSM/I retrieve information on the total atmospheric column water content. Initial methods relied on data from SSM/I and empirical relationships between the total precipitable water and surface specific humidity. In our work, improved methods for instantaneous retrievals were developed using a combination of data from SSM/I, SSMIS, AMSU-A and SST. The improved accuracy results from inclusion of the sounder data which helps distinguish variations near the surface from those at higher levels of the atmosphere. Jackson, D.L., G.A. Wick, and S.R. Smith, 2012: Evaluation of the satellite microwave multi-sensor retrieval of near-surface humidity and temperature using SAMOS observations and implications on satellite-derived heat and gas flux products. 18th Conference on Satellite Meteorology, Oceanography, and Climatology / First Joint AMS-Asia Satellite Meteorology Conference, New Orleans, LA, January 22-26, 2012. Jackson, D.L., and G.A Wick, 2010: Near-surface air temperature retrieval derived from AMSU-A and sea surface temperature observations, J. Atmos. Oceanic Technol.,27,1769-1776. Jackson D.L., G.A. Wick, and F.R. Robertson, 2009: Improved multi-sensor approach to satellite-retrieved near-surface specific humidity observations, J. Geophys. Res., 114, D16303, doi:10.1029/2008JD011341. Jackson D.L., G.A. Wick, and J.J. Bates, 2006: Near-surface retrieval of air temperature and specific humidity using multisensor microwave satellite observations, J. Geophys. Res., 111, D10306, doi10.1029/2005JD006431.